Chalkboard paint. You know, that amazing stuff that gives you a chalkboard surface on whatever you choose to put it on! 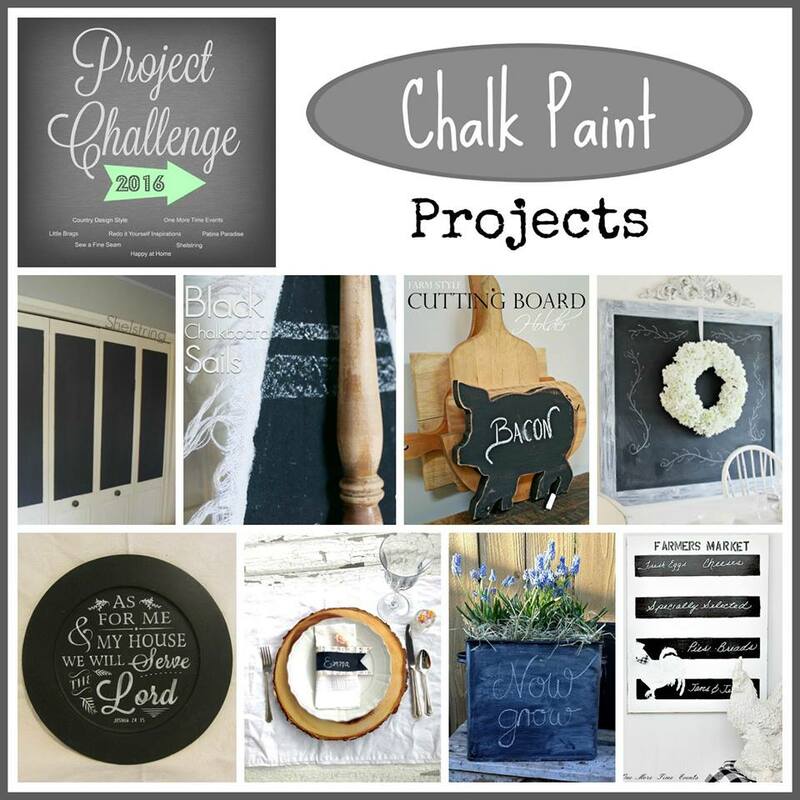 That is the category choice for this month’s Project Challenge. What is more classic than a chalkboard, right? 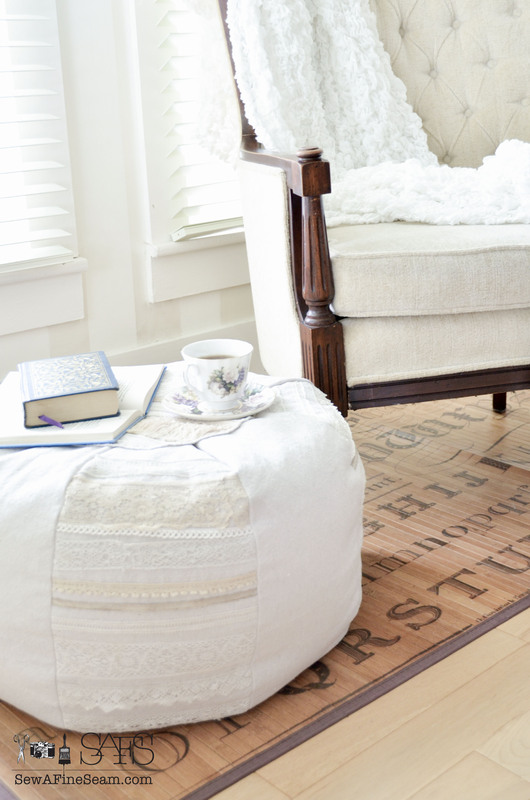 I wanted to think outside the box … er… chalkboard … and come up with something a bit different than another chalkboard. I already have chalkboard that I made by painting over an old, thrift-shop picture and sticking it back in the frame. I also needed to come up with an idea that used chalkboard paint AND was easy and fast to get done. Fast being very important because I totally waited till the day my photo was due to be added to the group collage to even THINK seriously about what to make. I’m not even sure how this idea came about but I found myself combining chalkboard paint and sheet music to create some fun, easy, fast name cards. I totally did this whole project including the photos in less than an hour. 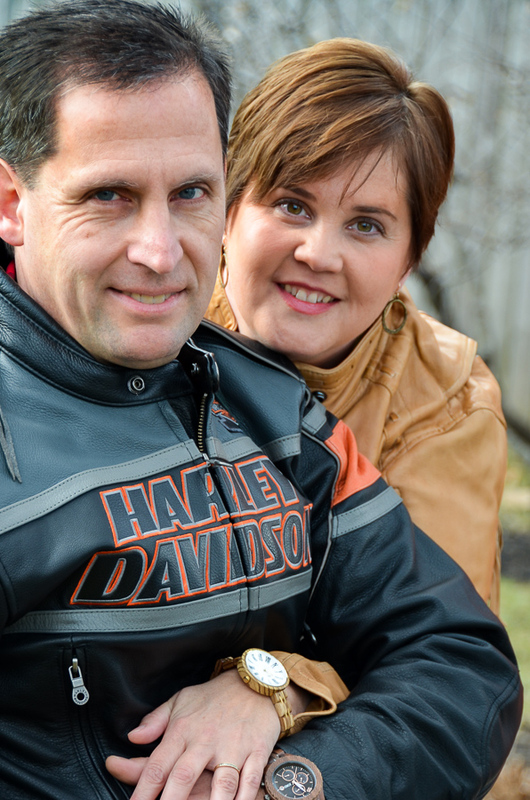 And so can you – come along and I’ll show you how! Any chalkboard paint will work. 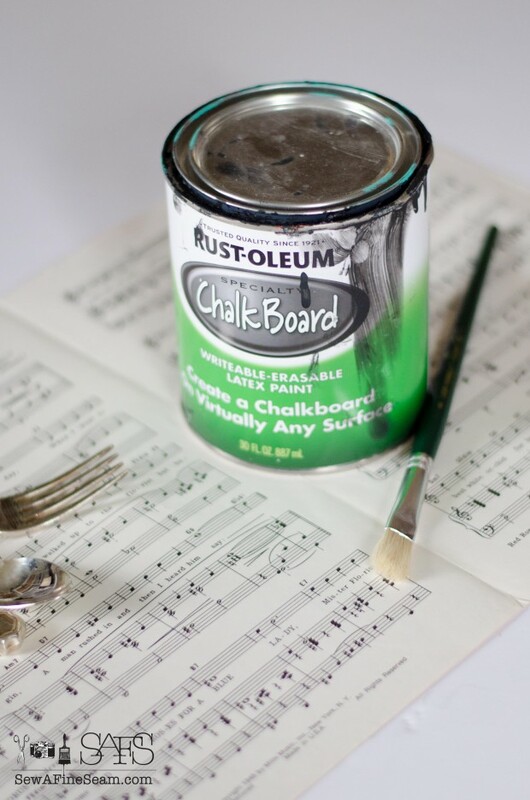 If you don’t have chalkboard paint on hand but you do have a chalk paint of some type in black, I’ve heard that will work too. I used a moderate width artist brush we had in our vast array of brushes. 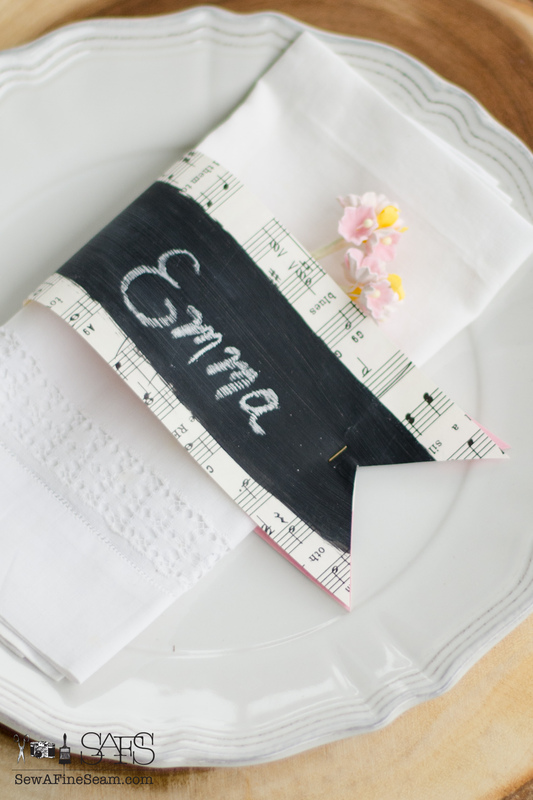 Paint a strip of black chalkboard paint across the sheet music. I did this freehand so the edges aren’t perfect – if you want a perfectly straight line, use some delicate-hold Frog tape to mark your lines. Width of chalkboard paint stripe is however wide you want it. Let first coat dry and paint another coat. Let 2nd coat dry and paint a 3rd coat. When the 3rd coat of chalkboard paint is dry, season the paint by rubbing the side of a piece of chalk all over it. I wanted the ends of my name card to be cut in a ‘v’ like a banner. 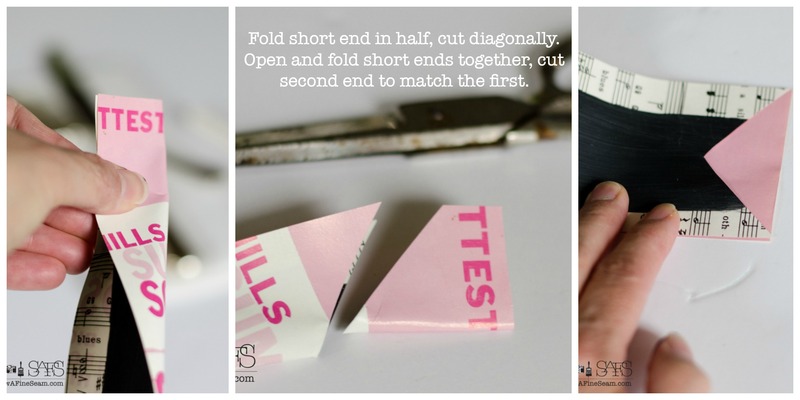 Fold short end in half, cut diagonally. Open and fold short ends together, cut second end to match first. I used my favorite stapler – a European model that used tiny, brass staples and looks totally adorable on craft projects. You can buy one for yourself here. I tucked some vintage paper flowers in with the napkin for springtime. 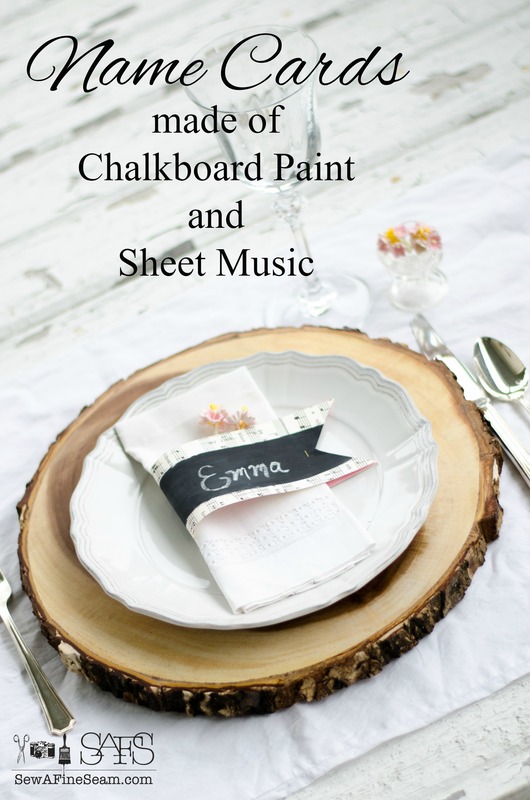 I love how the sheet music and chalkboard paint can work year round – just detail with different elements for different occasions and seasons. 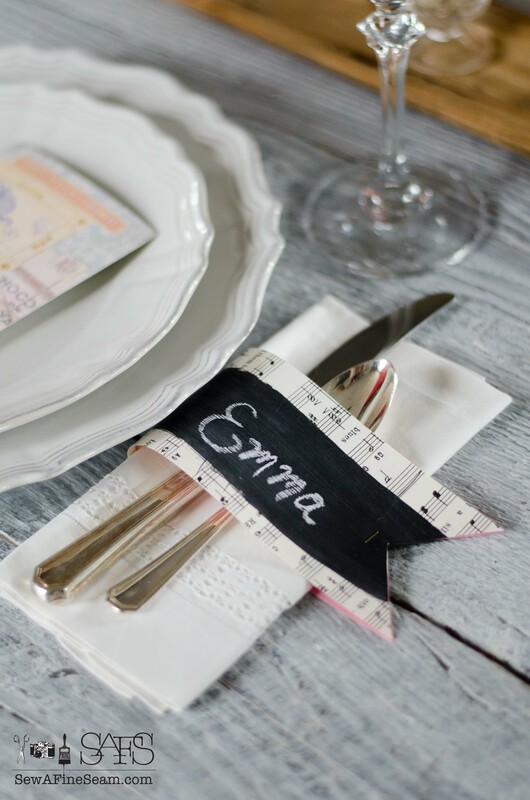 These could be reused – simply erase the name and add a new one and carefully tuck a clean napkin into the ‘ring’. 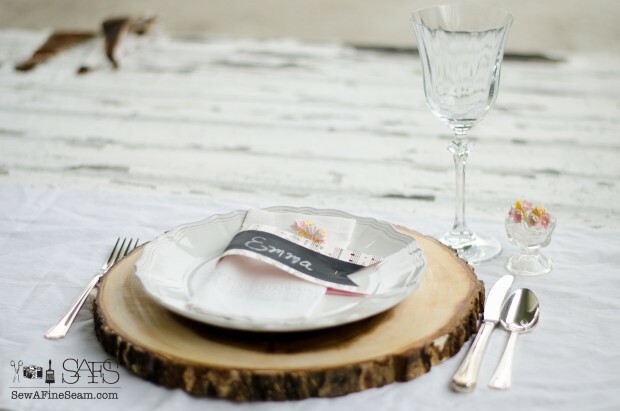 My first idea included the napkin and the knife and spoon inside the ring, and would be placed to the right side of the plate. As I was setting up for the beauty shots, I slipped the silver out and laid the napkin and name card on the plate and liked that better. Close up of the staple. If you don’t have a cute stapler you could punch a hole through both layers, in place of the staple, and tie with a ribbon to keep the ring around the napkin or silver. So simple. 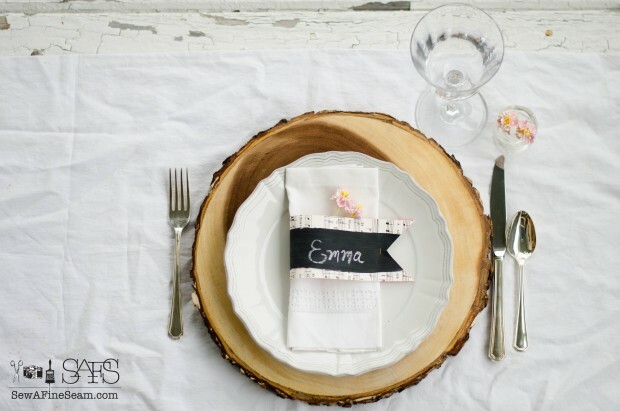 And yet it adds such an elegant and personal touch to the table. 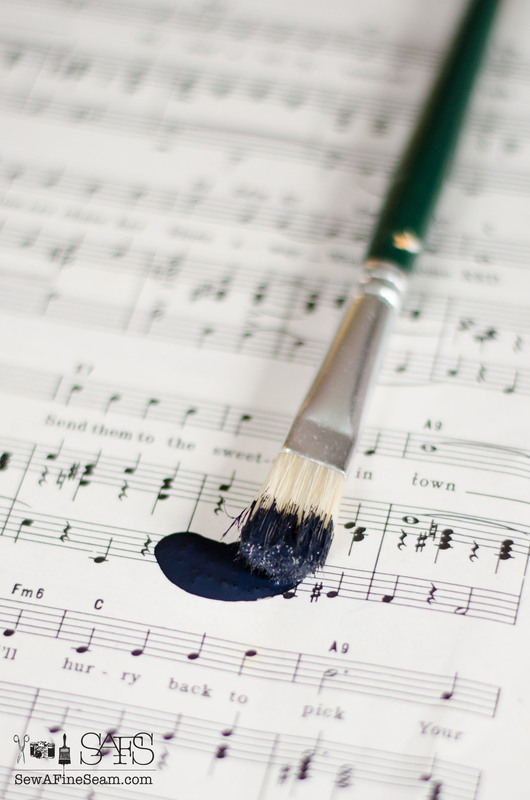 Keep your eyes open for sheet music languishing in the thrift shop next time you are out digging for treasures! 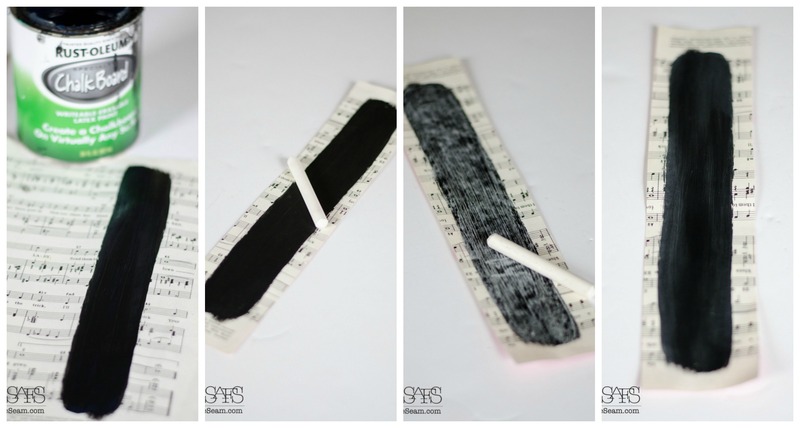 Check out how my friends used Chalkboard paint too! Jill this is such a cleaver idea… I thought I have seen every chalkboard idea out there…so cute! 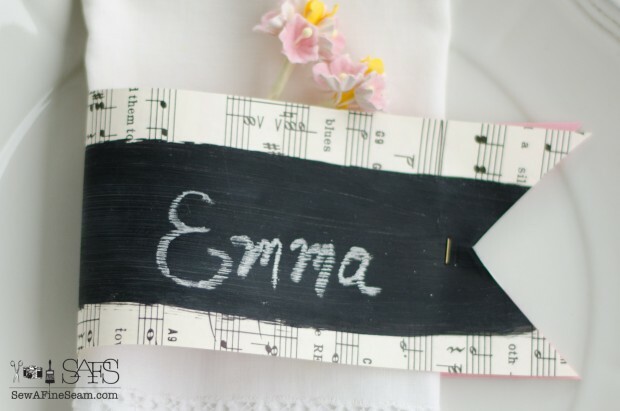 Love the look of the chalkboard with the sheet music. 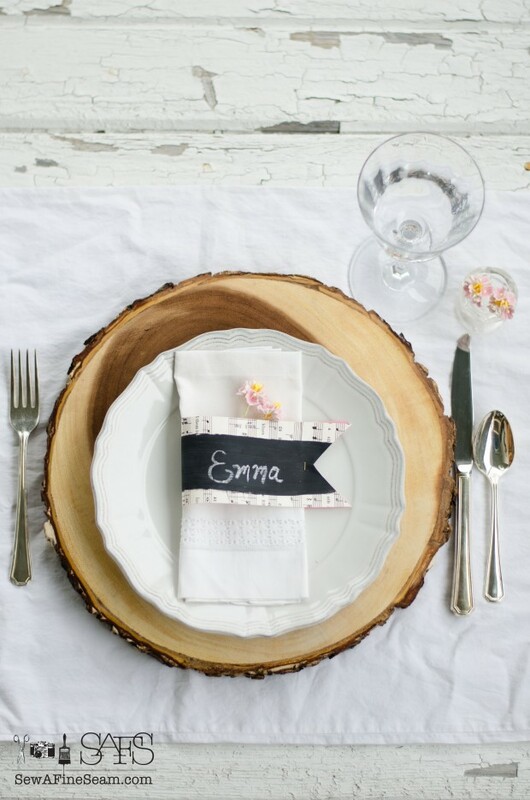 I’m hosting a ladies lunch next month and might need to steal er…borrow your idea. It’s funny how inspiration hits. So incredibly simple but never would have guessed it was. So delicate and can be used for so many occasions! You are very clever and talented. 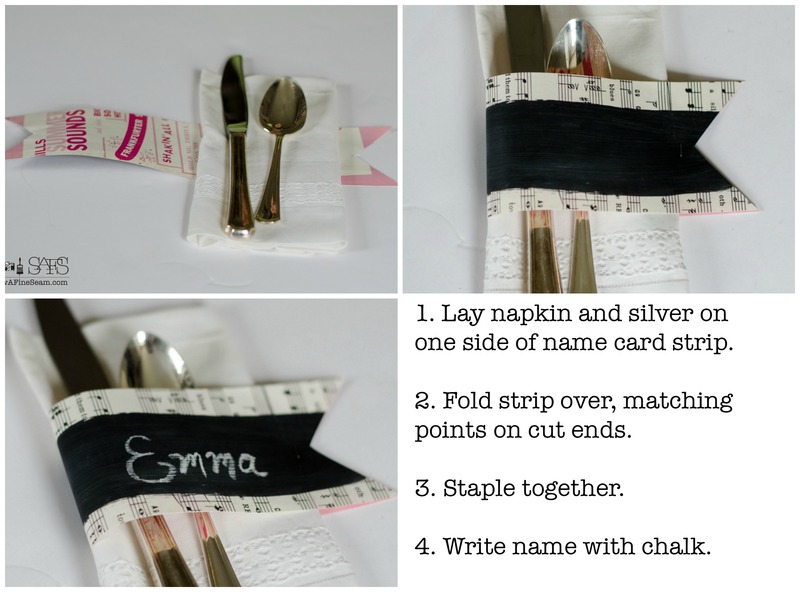 Love this idea, Jill! 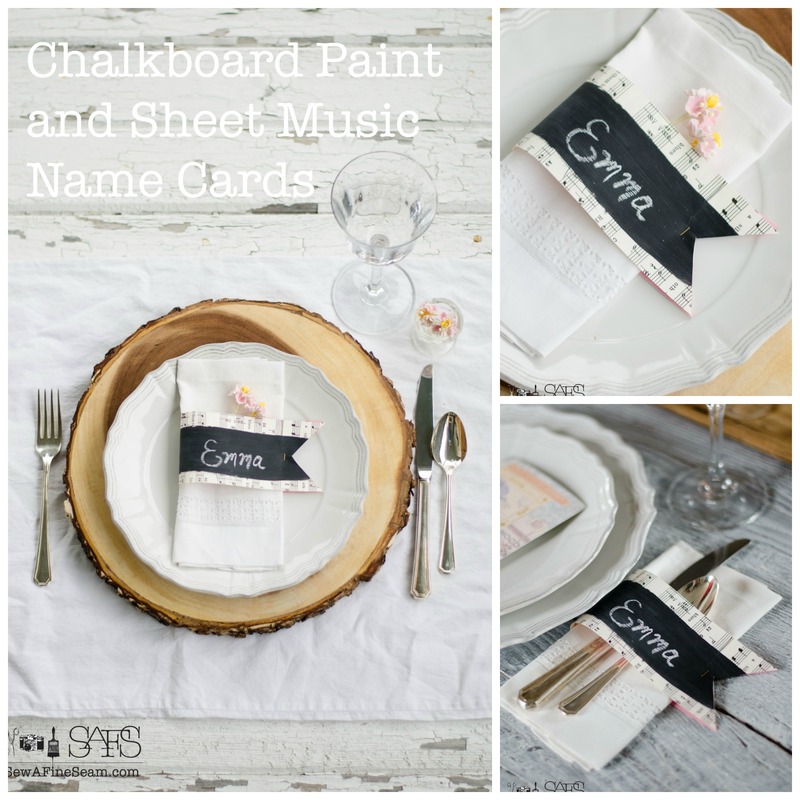 Jill, once again you used the music paper I love…..That is a super creative place holder idea, FOR SURE!!!! 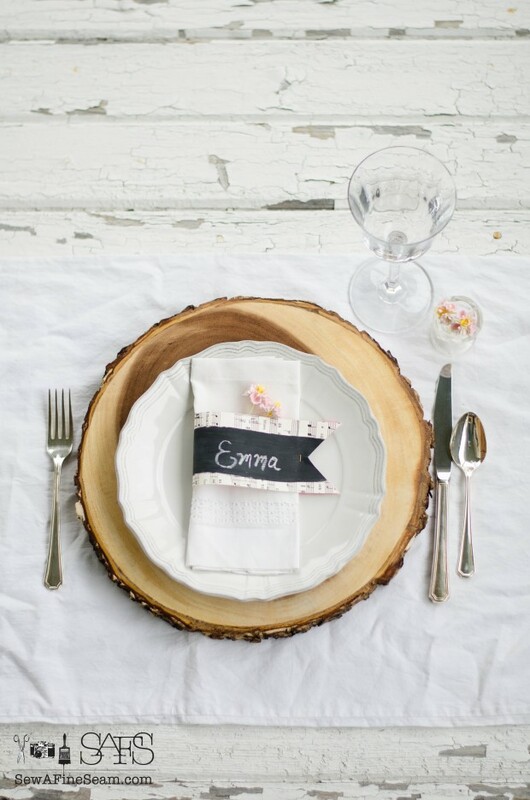 Great addition to a pretty and rustic table setting! And it’s super practical too! Great project! 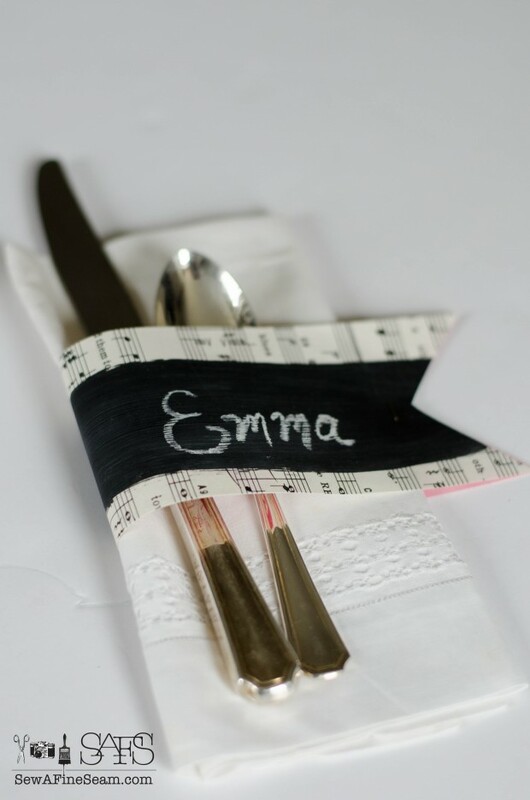 how creative you are to use it with the sheet music. and it looks quick and easy! thank you for sharing. Have a great weekend.